Applied training materials help today’s counseling students, faculty, and practitioners bring concepts to life. 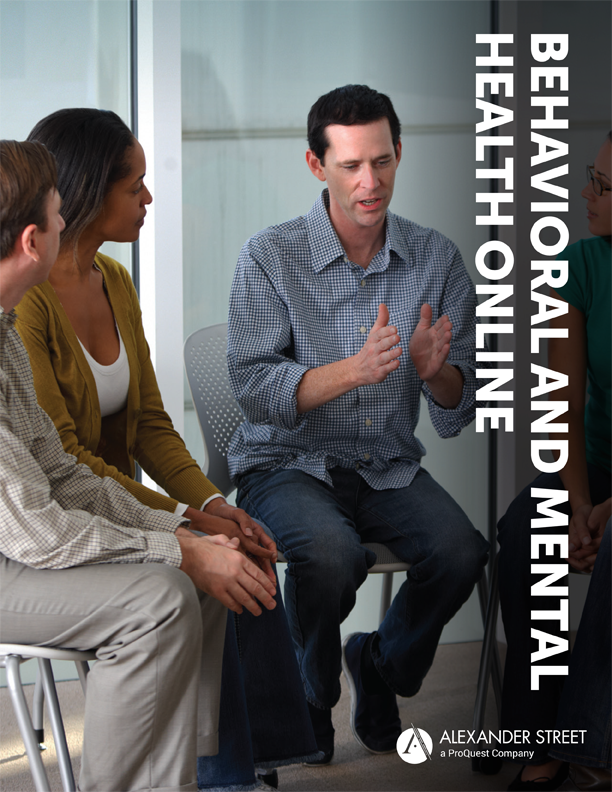 The award-winning resources in Alexander Street's Behavioral and Mental Health Online (formerly Complete Counseling and Therapy Package) provide a comprehensive, rich, and diverse collection of video and text for anyone studying or teaching in the area of mental health. Programs in counseling, social work, nursing, psychology and behavioral health will all benefit from the wide variety found in this body of content, which includes clinical mental health demonstrations, actual therapy sessions, compelling documentaries on the human condition, psychotherapy transcripts, as well client narratives and reference works. 80% of the content is exclusive to ProQuest, and the product is ever-growing with new content added quarterly. Users must be authenticated to see content linked to from this guide. This link searches all material except for Volume 1, which is on a different platform. Users must be authenticated to see content linked to from this guide. This content is on a different search platform and will need to be searched separately.